Scientists shed new light on the effects of tooth-wear and toothpick use among the famous Dmanisi hominins of 1.8 million years ago. Researchers continue to squeeze new information from the sensational fossil finds that were uncovered at Dmanisi in the Republic of Georgia between 1991 and 2005. Considered the earliest known hominin remains outside of Africa and the earliest known human presence in the Caucasus, they have yielded a wealth of data about an early form of Homo erectus, an ancient human precursor and possibly one of the first early human species to have "gone global", leaving their original African homelands. Now, researchers have found that normal wear and tooth picking could explain the apparent broad range of dental diversity and mandible (jaw) shape and orientation among the fossil remains at the Dmansi archaeological site. The ancient mandibles have been dated to nearly 1.8 million years ago, and displayed a puzzlingly wide range of variation that researchers have thus far been unable to explain. 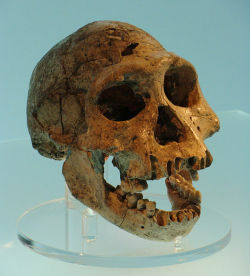 But using modern hunter-gatherer populations in Australia and Greenland as a reference, David Lordkipanidze and colleagues have studied denticular fossil finds at Dmanisi and the hominin fossil sites of Tighenif in North Africa, Koobi Fora in East Africa, and Sima de los Huesos in Spain to quantify the effects of tooth wear and wear-related bone remodeling using direct observations and data derived from computed tomography (CT) and scanning electron microscopy. Their findings reveal that tooth wear needs to be accounted for when conducting comparative taxonomic analyses of hominin mandibles. Discovered beneath a medieval castle near the junction of the Masavera and Pinezaouri rivers, the Dmanisi fossil finds have informed the field of human Eurasian beginnings, and some key assumptions about human origins research. Four hominin fossils, including thousands of extinct faunal finds (animal bones and bone fragments) and over 1,000 lithic artifacts (stone tools) were found by excavators within 2-4.5 meters of alluvium. Two nearly complete hominin crania were uncovered, exhibiting features much like early Homo erectus. But Dmanisi’s collection of hominin fossils revealed a species that was smaller-brained, yet with both primitive and derived (more advanced) skeletal traits, and an assemblage of stone tools of the earliest and simplest ("Mode 1" or Oldowan) industry. They were securely dated to about 1.8 million years BP. However, more recent test excavations at Dmanisi recovered lithic artifacts of the Oldowan variety and fossil bones that have pushed back the chronology and revealed that the hominins may have occupied the area repeatedly between 1.85 and 1.78 million years ago, a time period that predated the appearance, according to the fossil record, of Homo erectus in East Africa. This latest dental and mandible study has been published in the Proceedings of the National Academy of Sciences as Article #13-16052: “Tooth wear and dentoalveolar remodeling are key factors of morphological variation in the Dmanisi mandibles,” by Ann Margvelashvili, Christoph P.E. Zollikofer, David Lordkipanidze, Timo Peltomäki, and Marcia S. Ponce de León. Source: Adapted and edited from a press release and the related detailed published study in the Proceedings of the National Academy of Sciences.